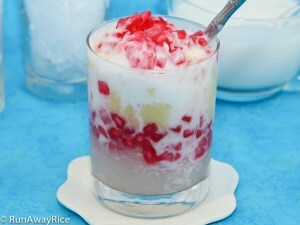 This easy recipe for Three Color Dessert (Che Ba Mau) captures the delicious flavors of summertime in a chilly dessert. Also called Rainbow Dessert, this beautifully layered, vibrant-colored dessert is refreshing, sweet and full of amazing textures. There’s nothing more enjoyable on a hot summer day than indulging in this chilly, sweet treat. I love making this dessert at home because I can control the sweetness. Often times when I buy it at the restaurants or banh mi/sandwich shops, the Three Color Dessert is overly sweet. Making it at home means you can make it just the way you like it. Enjoy! 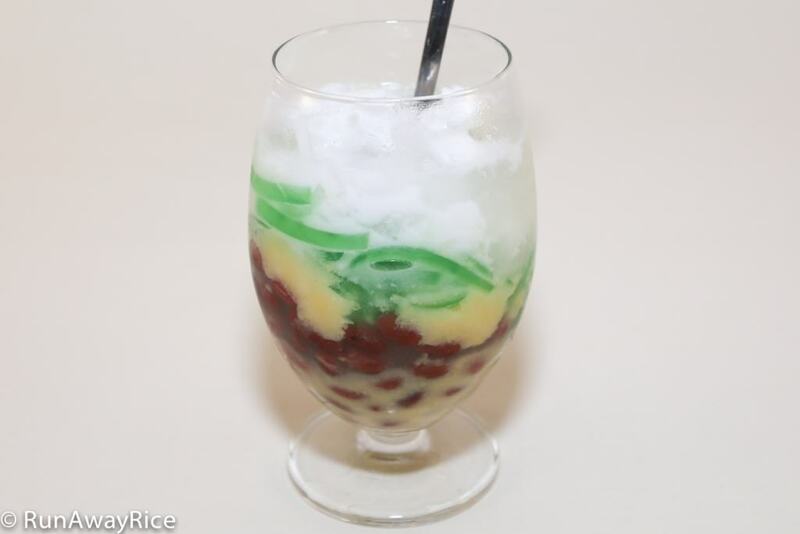 This recipe makes about 4 cups grated Pandan jelly and so you may have some leftovers. You can cut the jelly recipe in half or you can double the amount of red beans and mung bean to match the jelly. I love having some leftover jelly. Enjoy the extra jelly as is or add to icy drinks for an extra treat. My recipe is medium on the sweetness scale for desserts. Feel free to adjust to your tastes. If you are watching your sugar levels, consider cutting back on the sugar or using a sugar substitute. In a medium saucepan, add the water and sprinkle in the agar agar powder. Whisk together blending the powder and water. (The powder won’t dissolve completely until it’s heated.) Let the mixture rest for 15 minutes. Heat the mixture over Medium heat stirring constantly. As soon as it starts to bubble, add the sugar and turn off the heat. Continue stirring until the sugar is dissolved, approximately 2-3 minutes. Skim off the foam using a sieve or spoon and discard. Add the Pandan paste and combine well. Pour the jelly mixture into a medium dish or bowl. Use a spoon to skim off the bubbles from the top of the jelly. Allow to cool on the counter for 1 hour. Refrigerate for 4 hours until firm. Pour the red beans into a colander and rinse several times with cold water, washing away the canning liquid. Drain and place into a medium bowl. In a small saucepan, heat the water until it boils. Add the sugar and stir until dissolved, approximately 2-3 minutes. Add the syrup to the red beans and combine together. Let the red beans soak in the syrup until the dessert is ready to be served. In a small bowl, add the mashed mung bean and sugar. Combine until the the mixture is smooth and creamy. Set aside until ready to serve. To serve the dessert, add 1/2 cup crushed ice into a clear glass or dessert dish. 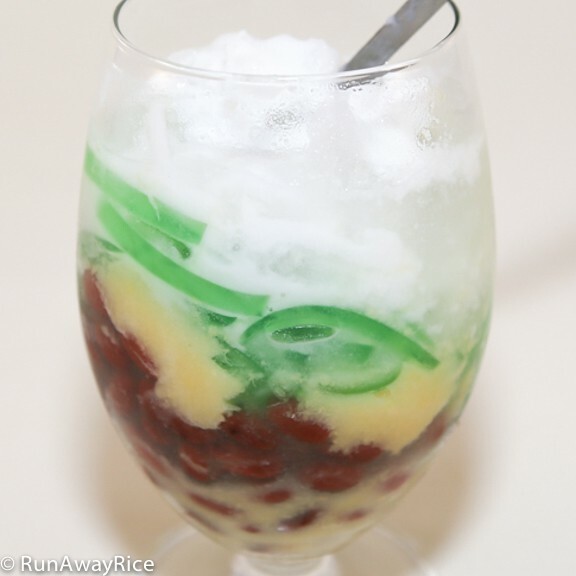 Add 2-3 tsp red bean, 1-2 tsp mashed mung bean, 2-3 Tbsp Pandan jelly, and another 1/2 cup crushed ice. Top the dessert with a heaping spoon of coconut sauce. Enjoy the Three Color Dessert right away! Store any remaining amounts in the refrigerator and enjoy within the week. 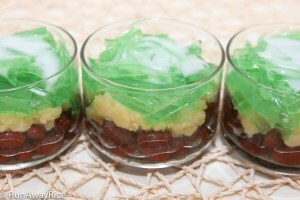 This easy recipe for Three Color Dessert (Che Ba Mau) captures the delicious flavors of summertime in a chilly dessert. Also called Rainbow Dessert, this beautifully layered, vibrant-colored dessert is refreshing, sweet and full of amazing textures. There's nothing more enjoyable on a hot summer day than indulging in this chilly, sweet treat. I love making this dessert at home because I can control the sweetness. Often times when I buy it at the restaurants or banh mi/sandwich shops, the Three Color Dessert is overly sweet. Making it at home means you can make it just the way you like it. Enjoy! In a medium saucepan, add the water and sprinkle in the agar agar powder. Whisk together blending the powder and water. (The powder won't dissolve completely until it's heated.) Let the mixture rest for 15 minutes. This recipes makes about 4 cups grated jelly and so you'll have some left over. You can cut the jelly recipe in half or you can double the amount of red beans and mung bean to match the jelly. I personally don't mind having some jelly leftover. I simply enjoy it as is. My recipe is medium on the sweetness scale for desserts but feel free to adjust to your tastes. If you are watching your sugar levels, consider cutting back on the sugar or using a sugar substitute. Thank you for the recipe card. I’m planning to make this weekend. Question- for coconut sauce, is there an instruction to make the sauce or can i just open up the can and use as is? 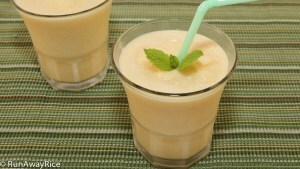 Here’s the coconut sauce recipe that goes with this dessert http://runawayrice.com/sauces-pickles/easy-coconut-sauce-nuoc-dua/ Enjoy! 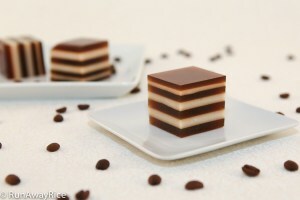 Hi Trang, this is my all-time favorite dessert and it was pretty easy to make. Thanks for adding the recipe card so I could print it out. My pleasure! I am so glad to hear you enjoyed the recipe and liked the recipe card!